Robert K. Koga died peacefully at his home in Fallbrook (San Diego County) on Sept. 8. He was 83. He was in the company of family and friends when he lost his struggle with mesothelioma, a cancer resulting from asbestos exposure. After serving in the U.S. Air Force during the Korean War, Koga became the second Asian American police officer hired by the Los Angeles Police Department in 1955; he retired in 1979. While assigned to the LAPD training academy, he saw that officers were experiencing problems with their arrest situations. He completely revamped their arrest-related training by developing and implementing an integrated system of search, handcuffing, arrest control and self-defense techniques that came to be known as the Koga Method. When the department was faced with challenging civil unrest events, he devised unique methods to separate and control demonstrators without the need to use physical force. His arrest and crowd-control techniques, now known as the Koga System, are now utilized around the world by law enforcement, military and civilian specialized services. The Koga Institute continues to provide this training today. For decades, Koga taught a wide variety of police skills across the U.S., focusing on improving safety and control practices for law enforcement personnel. He developed systematic techniques for street police officers, SWAT teams, riot- and crowd-control teams, and detention and corrections officers. He provided training for the Secret Service, Federal Air Marshals, and various other agencies, including the Navy Seals, Delta Force, the Royal Canadian Mounted Police, and the Royal Brigade Guards of the King of Saudi Arabia. His techniques are also taught in other countries, including Japan, China, and Mexico. “Robert established a huge and far-ranging community of peace officers who strive to follow his relentless example of dedication to the highest standards of personal and professional conduct and accountability,” the Koga Institute said in a statement. “He is remembered by family, friends, and students as a man with an extraordinary focus, a remarkable ability to anticipate the actions of others, and a lifelong dedication to raising standards of training throughout the law enforcement profession. Throughout his life, Koga embraced all forms of training and earned many black belts. He studied with aikido master Koichi Tohei, traveling with him during his tours through the U.S. Koga held a fifth dan in jiujitsu, awarded by Sanzo Seki Sensei, and a sho-dan in judo, which he earned in Japan. He was a master of jodo (stick fighting) and was trained in the use of the manriki-gusari, a length of chain weighted on each end. Koga began his martial arts studies when he was 12 years old, in order to combat the gangs he faced in the Topaz, Utah camp where he and his family had been forcibly interned during World War II. He continued his judo studies when his family resettled in Chicago and when he was in the Air Force and assigned to Japan. Koga was inducted into the World Martial Arts Masters Hall of Fame in Hartford, Conn., in 1996 and the California Martial Arts Masters Hall of Fame in Costa Mesa in 1998. In 2000, he was the Lifetime Achievement recipient of the California Governor’s Award for excellence in peace officer training. He authored four texts. The first two, no longer in publication, were co-written with John G. Nelson: “The Koga Method: Police Weaponless Control and Self-Defense Techniques” (1967) and “The Koga Method: Police Baton Techniques” (1968). His second two books, co-written with William L. Pelkey, were “Controlling Force: A Primer for Law Enforcement” (1994) and “Redirecting Force: A Manual for Law Enforcement Self-Defense” (1998). He also developed the “Practical Aikido” training course, which focuses real-life self-defense situations, and recorded a five-DVD series on the subject, produced by Black Belt Magazine in 2001. After retirement, Koga taught at Southern California colleges, including Cal State L.A., Pasadena City College, Cerritos College and Rio Hondo Community College. 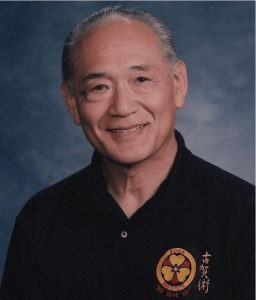 Koga was the first president of the California Asian Peace Officers Association, and a past president of the National Asian Peace Officers Association. He had boundless energy, was a voracious reader, and had a wide range of passionate interests. Perhaps surprising to many people, Koga was an avid fan of the historic American West. He enjoyed wearing western-style clothing, steer-roping, and riding his horses through rough and rugged land. He would have been happy to have been born a cowboy. Koga is survived by his wife, Susan; his children, Michael, Frank, Kelleen, and Thomas; his grandchildren, Kelsey, Jared, Kamryn, Trent, Rylee, and Kai; and his stepfather, Frank Shoda. On Sept. 11, the California Senate session was adjourned in Koga’s memory, with remarks by Sen. Joel Anderson (R-El Cajon). The family suggests that memorial donations be made to the Mesothelioma Applied Research Foundation (www.curemeso.org). The interment service was private. A public celebration of his life will be held on Saturday, Nov. 2, at 1 p.m. at the Ontario Convention Center, 2000 E. Convention Center Way in Ontario. For updates, visit www.kogainst.com.